I was asked to speak in church a couple of weeks ago on the theme of "Coming unto Christ." I thought I would post my talk here on the blog for our family records, and for anyone who might be interested to read my thoughts on the subject. Moroni 10:32 says, "Yea, come unto Christ, and be perfected in him, and deny yourselves of all ungodliness; and if ye shall deny yourselves of all ungodliness, and love God with all your might, mind and strength, then is his grace sufficient for you, that by his grace ye may be perfect in Christ; and if by the grace of God ye are perfect in Christ, ye can in nowise deny the power of God." What a powerful, hopeful scripture. Moroni 10:32, and all the references I find scattered throughout the scriptures that beckon us to "Come unto Christ" are invitations to us, to develop a more personal, closer relationship with our Savior, Jesus Christ. And that will be the theme of my words today. As I have studied this scripture to prepare for this talk, I have been reminded of an experience I had this past year. I read a wonderful book from an LDS author. I was impressed by the close relationship the author had with the Savior. I loved to read his tender testimony and personal experiences. I felt uplifted and encouraged after I read this book, but an urgency in the form of a question had settled in my mind and heart, "Do I really know my Savior, Jesus Christ? Do I have a personal relationship with Him? Will I recognize Him when I see Him again?" "Jami, all the scriptures are about Christ and His teachings. Studying the scriptures, as you have been is a key to your relationship with Christ that you have been unlocking all along." Yes! Why did I not see this as clearly before? All scriptures testify of Christ and His teachings. All of them can bring us closer to Him when we are reading them in the right spirit. 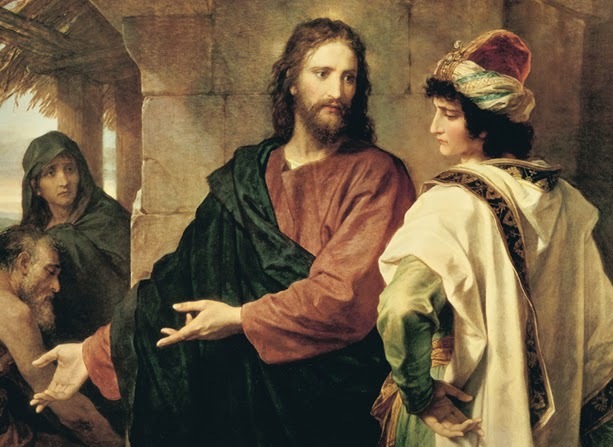 That's not to say that studying the names of Christ like this isn't a wonderful way to feel closer to and know our Savior better, but this experience helped me to see that I was actually much more aware of who my Savior was and had actually been working on that relationship as I studied all along. The Old Testament is filled with so many rich types of the Savior, and the voice of pre-mortal Christ, Jehovah, the New Testament - with all the tender, incredible stories of His life and ministry, the Book of Mormon - with the account of His ministry to the Nephites in the America's after His resurrection, and the Doctrine and Covenants - which is filled with accounts of His voice in the first person. When the Spirit taught me this truth - about all scripture testifying of Christ - I was reminded that I should take a look at my old set of scriptures. When I was attending Young Women's, I heard that there were a lot of references to Jesus Christ in the Book of Mormon. The subtitle of The Book of Mormon is after all "Another Testament of Jesus Christ." I decided to focus one of my read-throughs of the Book of Mormon on Christ. I marked every single direct reference to Christ I came across in its pages. That copy of the Book of Mormon is filled with neon dashes, marking His presence on every page - except for just a few, and on those pages if I remember correctly, He is actually speaking. The Book of Mormon truly testifies of Him - and bear my personal witness that it is true. If you don't already know that for yourself, I challenge you to find out for yourself by reading this book. It can help us to know our Savior better. All of the scriptures, as I was recently and tenderly reminded, testify of Jesus Christ. They help us to know Him, His works, His character, His glory and His nature - and HOW we can better establish a personal relationship with Him. Brothers and Sisters, if we want to partake of the fruit of the tree of life, we HAVE to hold to the rod. If we desire to have a personal relationship with Christ, we must include consistent, meaningful scripture study as a part of that pursuit. If we didn't eat for a day or two, or a month - we wouldn't be sitting pretty physically. If a day goes by that we have failed to study our scriptures, our spirits and our relationship with Christ grows weaker and malnourished. Scripture study - alongside sincere prayer - is a glorious key to unlocking the door to a personal relationship with Christ. So, what do the scriptures tell us about Coming unto Christ? What must we do if we want to personally know the Savior better? In verses and surrounding verses of scripture that included the phrases, "Come unto me." "Come unto Christ." and "Come unto Him." I noticed a couple of themes in the instruction I think can help to answer that question. Today I will talk about two interactions Christ had in the scriptures that illuminate important principles about how we are able to develop that relationship with Him. Image Source. "Christ and the Rich Young Ruler" By: Hofmann. In Luke 18:18-25 we read about a certain ruler, who came to Christ, asking Him what he needed to do to inherit eternal life. We know this was a decent guy. A Jewish man of faith because of the way he answered Christ when he was asked if he kept the commandments. "From his youth up" he had been honest, honored his parents, did not steal, and was pure and virtuous. So far, so good. But in verse 22 we gain insight into the discerning power Christ has to see men's hearts. It says. . . The young ruler was very sorrowful: for he was very rich. I want to submit two things for your consideration on these verses. #1 - That we will have to make an accounting before God how we handled our money in this life. We do need to be giving of our substance to the poor and the needy. Generous fast offerings, as Bishop Smith has recently encouraged us all to give, are very important. #2 - These verses aren't only about wealth. So, if you aren't a wealthy ruler - you don't get to sit this one out! In fact, I believe these verses are about much, much more than wealth - they are about our desires. Our priorities. Where are hearts? Where our treasure is, there will our heart be also. Do we have time for social media, but not for scripture study? Do we excuse media that is offensive to the spirit - "It's only a little violence." Do we ignore promptings to share the gospel because our comfort and ego is more important to us? Do we pardon our cutting sarcasm and crass humor, because we value a laugh or a shocked reaction more than a unifying and loving feeling? Do we spend more time pondering and reveling the faults of others, than on all the things we need to change and become to come unto Christ? Perhaps we might generally say that like the young ruler that we are clean from sin. While we may keep the basic commandments, this is a starting point not an end point in our journey. Anything we have in our lives about which we say or by our actions demonstrate, "I could NEVER give that up! That's just too important to me." That is probably precisely the thing we must leave behind to follow Christ. The Spirit will testify to you what that thing is. "The gospel of Jesus Christ encompasses much more than avoiding, overcoming, and being cleansed from sin and the bad influences in our lives; it also essentially entails doing good, being good, and becoming better. Repenting of our sins and seeking forgiveness are spiritually necessary, and we must always do so. But remission of sin is not the only or even the ultimate purpose of the gospel. To have our hearts changed by the Holy Spirit such that “we have no more disposition to do evil, but to do good continually” (Mosiah 5:2), as did King Benjamin’s people, is the covenant responsibility we have accepted. This mighty change is not simply the result of working harder or developing greater individual discipline. Rather, it is the consequence of a fundamental change in our desires, our motives, and our natures made possible through the Atonement of Christ the Lord. Our spiritual purpose is to overcome both sin and the desire to sin, both the taint and the tyranny of sin." "Let me suggest that hands are made clean through the process of putting off the natural man and by overcoming sin and the evil influences in our lives through the Savior’s Atonement. Hearts are purified as we receive His strengthening power to do good and become better. All of our worthy desires and good works, as necessary as they are, can never produce clean hands and a pure heart. It is the Atonement of Jesus Christ that provides both a cleansing and redeeming power that helps us to overcome sin and a sanctifying and strengthening power that helps us to become better than we ever could by relying only upon our own strength. The infinite Atonement is for both the sinner and for the saint in each of us." To partake of that atoning power, we must love Christ first, and leave the rest behind. He must be our number one priority. The more we leave behind the world and follow Him, the more we will find Him in our lives and the more closeness we will feel with Him. Next I want to talk about another interaction with Christ in the scriptures. If we are pondering how we might better improve our relationship with Christ, it is helpful to think about how our other relationships and friendships work. We ultimately, are drawn to and feel a kinship with those who we are most like - those who have the same goals and desires in life as we do. The more we pattern our goals, and desires and lives after the life of Christ, the stronger our relationship with Him becomes. "I have a work for thee, Moses, my son; and thou art in the similitude of mine Only Begotten; and mine Only Begotten is and shall be the Savior, for he is full of grace and truth. . ."
Moses, as we all know was a vitally important prophet in the old testament and a wonderful type of Christ. He truly lived a life, "in similitude" of the life that Christ led Himself. I believe that the special commission God had for Moses, can be applied to us all. We all - with God's help and grace - need to live so that it might have been said of us, that we lived lives in similitude of the life of Christ. All the covenants that we make with God and renew as we partake of the sacrament each week are symbolic of Christ and His sacrifice. As we make and keep our covenants, we become more empowered to become like the Savior. 1. God's work and glory, becomes our work and glory. Image Credit. 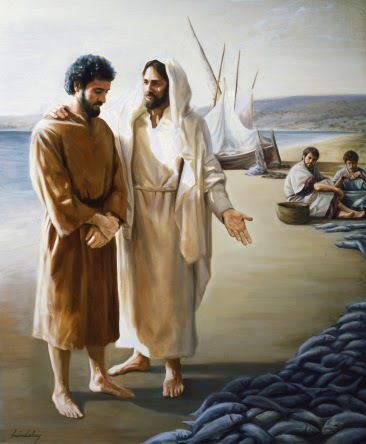 Jesus Christ asks Peter "Lovest Thou Me More Than These?" God's work and His glory is, "To bring to pass the immortality and eternal life of man." We do that first for ourselves by being baptized and making covenants with God and going to the temple to make covenants as well. We go further as we serve as righteous mothers and fathers in Zion, "Strengthen our Stakes" through righteously and faithfully serving in our callings and being a diligent visiting teachers or home teachers. We "enlarge (our stake's) borders" by inviting others to come to Christ through fellowship and missionary work. We also do this by doing family history work and serving in the temple and doing the work for others who have passed on. These are all significant ways we help to bring to pass God's work and His glory. We can know that this is our glory when we feel pleased and anxious to go do His work. Complaining and a sense of irritation are signs that this is something we can work on further. Example from my life: Becoming a mother was hard. I had even always wanted to be a stay-at-home mom. In middle school I remember writing down something about where I wanted to be in 15 years. I saw myself with a home gloriously filled with 10 children laughing and playing together in my yard with lush green grass with a white picket fence. Their father adored me. I adored him. The children crawled around and ran and played joyously together. Spraying each other in the perfectly appropriate way with the hose. This was a Pinterest-perfect vision of my future life. Well, then. I now live in Tucson. Where is my green grass?! I got married. And after some struggle we have two children. Somehow in all my dreaming about my future, I had missed the memo that motherhood would be hard! I wasn't feeling about motherhood like I thought I should, and so I started to get to work - reading and praying. I found and read a wonderful book By Stephanie Dibb Sorenson called "Covenant Motherhood." She recalled an experience where she was not enjoying motherhood like she thought she should. And so she prayed to be able to "love what God loves." When she changed her baby's soiled diaper, she had a scripture come to her mind, "Though your sins be as scarlet, they shall be as white as snow." This small act of cleansing her little child's bottom - became significant - a symbol and a type of the work that Christ has done for us in cleansing us of our sins. We mess up over and over. But he doesn't grumble about having to clean up our mess. He just does it with love and tenderness. Probably this experience and scripture meant so much to me because I dislike cleaning and changing diapers so much. But, in any case - as I have prayed to "love what God loves" and for "His work and glory" to become my own, He has started to show me how every single thing I do, and say, and how I do it can become symbolic of all that Christ did for us - and that I can even come to truly love what He loves. 2. We have developed sufficient submissiveness to God's will. Image credit. "Jesus Praying in Gethsemane"
"While most of our suffering is self-inflicted, some is caused by or permitted by God. This sobering reality calls for deep submissiveness, especially when God does not remove the cup from us. In such circumstances, when reminded about the premortal shouting for joy as this life’s plan was unfolded (see Job 38:7), we can perhaps be pardoned if, in some moments, we wonder what all the shouting was about. For the faithful, what finally emerges is an understanding of “things as they really are” (Jacob 4:13), such as the reassuring realization that we are in the Lord’s hands! But, brothers and sisters, we were never really anywhere else! . . .
“Know ye not that ye are in the hands of God?” Likewise, “all flesh” and “the heavens and the earth”! Perhaps the realization of being in God’s hands comes fully only as we ponder the significance of the prints in the hands of our submissive Savior. Some will have to ask what those wounds are, having been estranged. 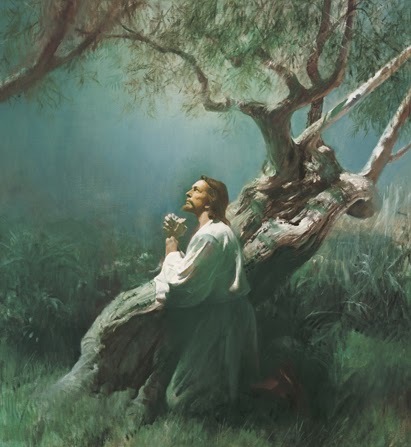 These are they who “regard not the work of the Lord, neither consider the operation of his hands.” The more we study, pray, and ponder the awesome Atonement, the more we are willing to acknowledge that we are in His and the Father’s hands. . . Example from my life: So, recently I have struggled with some health issues. I'm not going to go into them here, but they have been very difficult for me and confusing at times. But, God has been showing me what I need to become through this trial. As C.S. Lewis said something along the lines that we are cottages, thinking we need only a patch on our roof, and maybe the addition of a room or two, but we don't realize that God is making us into mansions! We have to be completely torn down and rebuilt! God's vision for our lives is so much bigger than the vision we have for them. The process of change can be very painful to endure at times. But, when we trust that we are in the hands of a loving God, who is helping us to become our very best selves, it makes it a bit easier to submit. And as we study Christ's life and the atonement, we will have a perfect example to focus on and remember. 3. We have received the gift of Charity. "And charity suffereth long, and is kind, and envieth not, and is not puffed up, seeketh not her own, is not easily provoked, thinketh no evil, and rejoiceth not in iniquity but rejoiceth in the truth, beareth all things, hopeth all things, endureth all things. Wherefore, my beloved bretheren, if ye have not charity, ye are nothing, for charity never faileth. Wherefore, cleave unto charity, which is the greatest of all, for all things must fail - But charity is the pure love of Christ, and it endureth forever; and whoso is found possessed of it at the last day, it shall be well with him. Wherefore, my beloved bretheren, pray unto the Father with all the energy of heart, that ye may be filled with this love, which he hath bestowed upon all who are true followers of his Son, Jesus Christ; that ye may become the sons of God; that when he shall appear we shall be like him, for we shall see him as he is; that we may have this hope; that we may be purified even as he is pure. . ."
Image Credit. 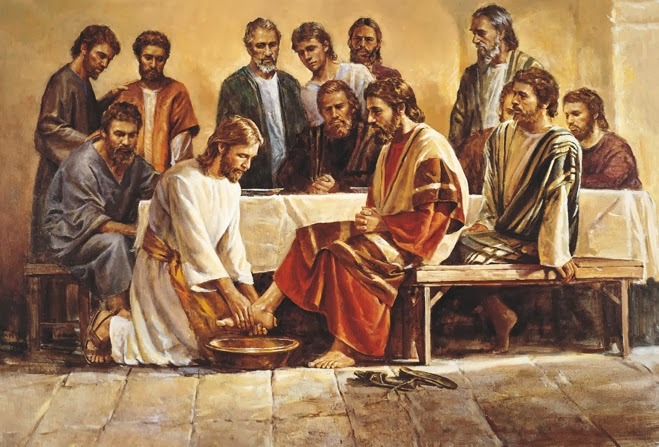 "Jesus Washing the Apostles' Feet"
If we want to become charitable, we should pray from this gift of the Spirit. It is essential to who we must become. This does not come easily for me, but as I have prayed to recieve this gift, I have felt God's power in expanding my awareness of others and my tenderness towards them. We inch our way there, by following the quiet whisperings of the Holy Ghost. Everyone experiences the Holy Ghost - also called the "Light of Christ" - differently. The key is for each of us to learn to recognize His voice when it speaks to us and to follow it. When we have been baptized and have received the gift of the Holy Ghost, we qualify for the opportunity to have the Holy Ghost to guide us all the time. - When you receive what you know to be a prompting, follow it right away. I love my Savior, Jesus Christ. My relationship with Him is everything to me. I am so grateful for the life He lived and gave so that we can each have the opportunity to live with our Father in Heaven again. He was the perfect example for us all. I know that as we heed the promptings of the Spirit, study God's word with diligence, leave our worldly priorities behind us, and pray to know our Savior, we each can come to know and be perfected in Him. He surely will not hold back His face from us. I say all of these things in the sacred, name of Jesus Christ. Amen.